A recently launched documentary film on the life of Cork trade unionist, Irish republican and socialist Tadhg Barry is to feature at the Spirit of Mother Jones Festival on Wednesday, 31st January. It will be shown at the Firkin Crane theatre at 12.00 Noon. Barry, a city alderman on Cork Corporation, was shot dead at Ballykinlar internment camp in Co. Down in November 1921. Tadhg Barry Remembered, a documentary by Framework Films in conjunction with Cork Council of Trade Unions was made for Cork Community Television and explores Barry’s growing involvement in labour politics and the advanced nationalist movement. It tells of his journalistic writings on the Gaelic Athletic Association and the labour movement. The following article is by local historian Donal Ó Drisceóil from UCC. From the turn of the century, he became immersed in the growing national, cultural literary and political revival and moved in these circles which were led by Tomas MacCurtain, Sean O’Hegarty and Terence MacSwiney. Tadhg was a brilliant organizer, keeper of notes and minutes, fine writer, quietly efficient and had wide interests. organised it over a period of years. He had been involved with a number of GAA Clubs including Eire Og, Sundays Well Hurling Club and Fainne an Lae Camogie Club on Blarney Street. He played hurling, refereed, coached hurling and camogie, wrote as the columnist Ciotog in the Cork Free Press. He even found time to write a book “Hurling and How to Play it” in 1916. He became more active with the Irish Volunteers and organized meetings for Larkin and James Connolly. Following the period of confusion in Cork which accompanied the 1916 Rising, Barry was active in establishing the ITGWU, following its virtual demise after the 1909 Cork Lockout. As he became more prominent, due to mass imprisonments of leaders after 1916, he attracted attention from the authorities and spent much of 1917 in prison. He then combined his union activities with his public duties, which was extraordinarily difficult at a time when two Lord Mayors of Cork died, one murdered and one on hunger strike. With virtual war taking place on the City streets, he managed to organize the Irish Trade Union Congress AGM in the old Connolly Hall in August 1920, however it was only a matter of time before he was arrested. Finally in early February 1921, he was picked up and sent to Ballykinlar Camp in Co Down, where he organised the camp activities and recreation, many socialist in nature to keep the hundreds of volunteers active in those months. As the Treaty talks progressed after the Truce, some of the volunteers were being released. On 15th November 1921, as he joined many others to say goodbye to a departing group, he was suddenly shot dead by a young sentry named Barrett, who seemed to have fired in panic. The cover up started immediately and the inquest was inconclusive as the British military authorities refused to cooperate. On arrival in Cork, the body of Tadhg Barry was met by tens of thousands of people representing all shades of union, labour, nationalist and republican opinion as his remains were taken to the North Chapel. 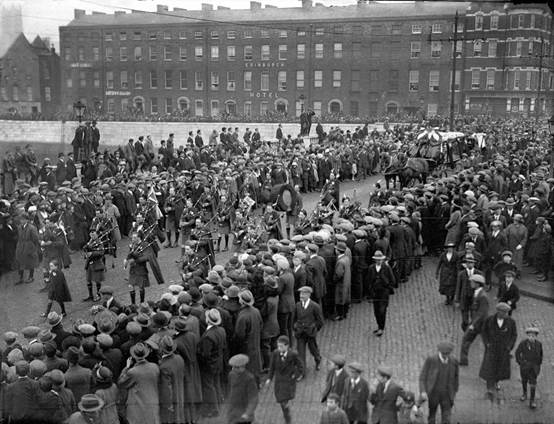 Sunday 20th November 1921 saw a huge turnout of people again on the route to his final resting place at St Finbarr’s cemetery. 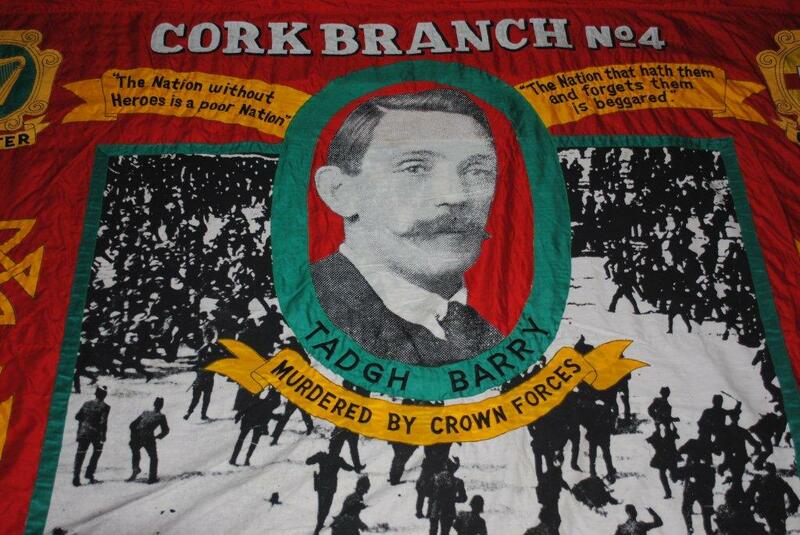 Tadhg Barry represented a proud socialist republican tradition in the Connolly mould. The British forces regarded him as a serious troublemaker; however his active involvement in community, sporting and social organisations made him well known throughout the city. He operated quietly in many organizations and had a reputation of a man who got things done. His short lifetime of service deserves to be more widely remembered. Our thanks to Donal O’Drisceoil for his research from which the above is drawn and which is contained in his pamphlet Tadhg Barry (1880-1921) The Story of an Irish Revolutionary. 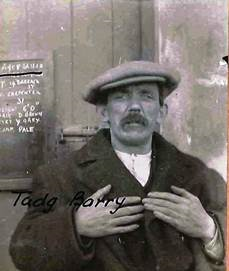 “Tadhg Barry Remembered,” Produced by Framework Films in collaboration with the Cork Council of Trade Unions. This film followed by a discussion will be shown at 12 noon at the Firkin Crane on Wednesday 31st July 2013 as part of the “Spirit of Mother Jones Festival”. All are welcome.